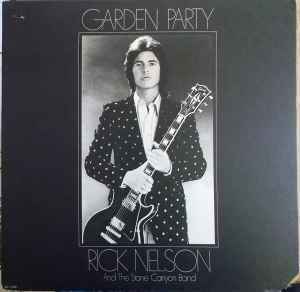 Say what you will about Rick Nelson, the album jacket for Garden Party is nothing short of stunning, with Rick looking more handsome than ever before in an embroidered velvet jacket, holding the neck of his rather heavy Les Paul Gibson in both hands. “Garden Party,” a song of redemption and peace wasn’t the first self reflective number Nelson ever recorded, there was the equally haunting number “Teen Idol,” from back when. Though when it comes to this single, Rick’s vocals are even more present and clear than on any recording he’s ever made, coming across as strong, surprisingly intimate, controlled, earnest and with a visionary sense of honesty. On a whole, Garden Party (the album) is very ambitious, even lofty, where he pushes for a not larger than life, but a bigger sound. Nearly all of the songs are laced with an alternative gentle county feel, transitioning from quiet to loud with the production and engineering skills Nelson has learned from his previous incarnation as Ricky Nelson. In many ways Garden Party stands as the last testament to an inspired and inspiring underrated artist who died far too young. *** The Fun Facts … As to the song “Garden Party”: The lyrics to the song provide a detailed account of what transpired that fateful evening at Madison Square Garden, with listeners continually attempting to connect the dots. “My old friends,” refers to the other artists on the bill that night, Bo Diddley, Bobby Rydell and the Coasters. “Yoko brought her walrus” was a nod to John Lennon (“I Am the Walrus) and Yoko Ono who were both at the show that evening. “I said hello to Mary Lou, she belongs to me” were two of the songs Nelson sang, while “I sang a song about a honky tonk,” referenced “Honky Tonk Woman” by the Rolling Stones, a cover Rick laid down. “Out stepped Johnny B. Goode” was a gesture to the night’s headliner Chuck Berry, as was the line “Playing guitar like ringing a bell,” a line from Berry’s 1958 hit sing. It seems the lyrics that most captured everyone’s attention were “Mr. Hughes hid in Dylan’s shoes.” While most thought Rick was referencing Howard Hughes, in reality it was Nelson’s dear friend George Harrison (of the Beatles) who was known to register at hotels using the name Hughes, and attended the show in disguise along with Mr. Dylan.